Sometimes it’s the little things in life that are the most dangerous. I survived petting a lion in Zambia and driving through crazed Athens traffic. But I was done in by my hotel door in Bosnia. In my own defense, it was an exceptionally high door threshold that you truly had to step over, sort of like I’ve seen on some ships. I guess I didn’t step quite high enough … and was down for the count. When a night’s sleep and a couple of Advil didn’t alleviate the pain—well, okay, when I almost collapsed in a heap on the bathroom floor trying to put weight on that foot getting out of the shower—I decided some actual medical attention might be a good idea. As charmed as I was by Mostar, the historic district (aka a Sea of Cobblestones) didn’t seem like a promising place for modern medicine, so I made a run for the border, back to Croatia, which seemed like my best bet for finding western-style healthcare. It also had the advantage of allowing me to stick with my original itinerary—which meant I’d have a hotel bed to sleep in that night. I had this unarticulated (and stupid) idea in my mind that if I didn’t take any painkillers, it would mean the injury was not that serious. As a result, struggling up and down stairs with my suitcase to get from hotel to car, multiple hours of driving with my foot throbbing, a 90+ degree day, and a stop at a clinic where they told me that they couldn’t help me, had about done me in. The last straw was when my rental car wouldn’t start. Piercing pain with every step, hot sun beating down on my head, I felt the tears gathering. I hovered on the brink of a meltdown for what seemed like forever. Only the reminder that at the end of the meltdown I’d still be in the same predicament held back the tears. Rental car company wasn’t answering the phone and I couldn’t walk to get help (since the clinic couldn’t help me medically, I assumed they wouldn’t be able to help me mechanically). Finally, I swallowed my pride and unwillingness to play the helpless female, and asked a group of men chatting in front of the clinic for help. I’m not sure they spoke English, but my incoherent and frazzled look communicated better than words. But then I couldn’t decide if I should be grateful or irritated that the man who helped me was able to start the car within about a minute. 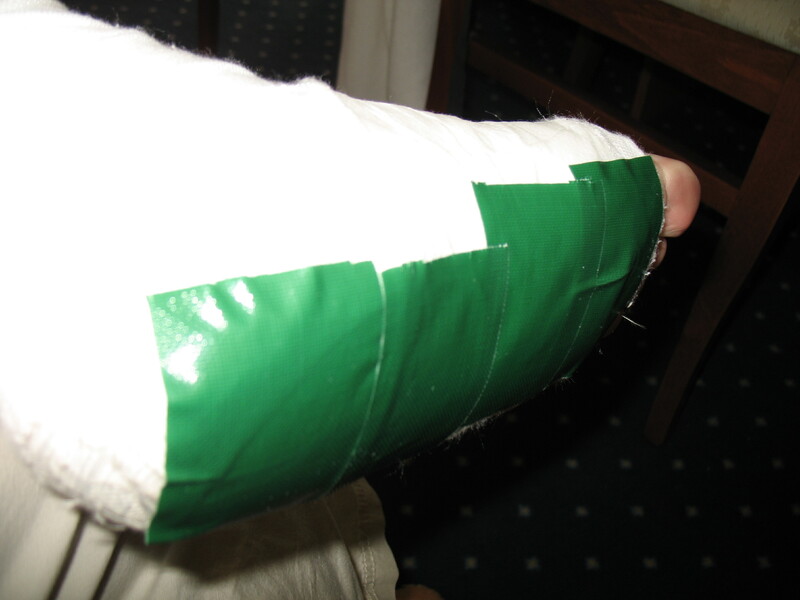 I reinforced the gauze of my Croatian cast with duct tape so it would survive the trip through Croatia, to the airport, and on to Vienna. Persistent wandering led me to the emergency room and then the radiology department, also deserted until I ignored all hospital rules and started peering into one exam room after another—“Hello?”—until a radiologist appeared. Post-x-ray, I joined what must have been the only human beings in the building—a group of elderly Croatians in a waiting room. I don’t know if they were waiting for medical care or this was just where they met for afternoon coffee, but I ignored their energetic chatter (since I don’t speak Croatian) until I heard a doctor’s voice mention an “Amerikanska.” All eyes turned to me. I guess I stood out a little. Fortunately, the doctor spoke English. Unfortunately, he confirmed what I’d feared—the foot was broken. I was introduced to the Croatian cast—a bit of plaster on my heel wrapped in lots of gauze. 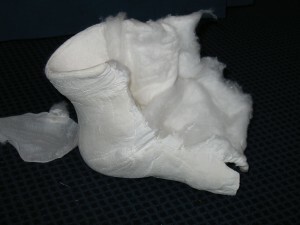 He assured me it was a walking cast and that when the gauze started falling apart, I could come back and get it re-wrapped. I did not find that comforting as I wasn’t sure it would last through the parking lot to get back to my car. A few hours later, the second tear storm threatened. Instead of a couple of days wandering the streets of old town Korcula, I was stuck at this all-inclusive tourist hotel with mediocre food, unable to walk without my “cast” falling apart. 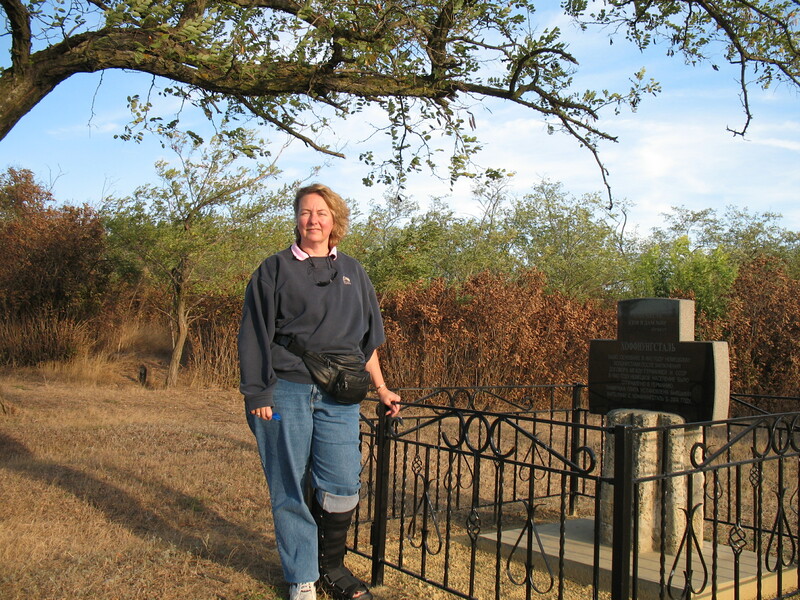 But the worst thing was figuring out whether my gauze-wrapped foot would hold up (or not) to the main part of my trip—tromping through ancestral villages in rural Ukraine, which involves a lot of unpaved, dusty roads, goose-poop-filled yards, and overgrown cemeteries. Should I just cancel that part of the trip and fly home? A few snips from ordinary desk scissors and voila! The cast is gone! Meet my friends for the flight to Odessa as planned. Next stop—rural Ukraine! Genealogists are like the postal service—neither rain, nor sleet, nor a broken foot will keep us from tromping through cemeteries and ancestral towns. I wish you good luck on all your journeys. May a good plan B always be with you. And friends who understand them. And nice people abroad who help you in the meantime. Monika – what nice words – thank you! I always say that when something goes terribly wrong during travel, at least it gives me a good story to tell. And this is one of the most adventurous ones! So fun – this is what I love about connecting with my ancestral towns. Along the way, I get to know new friends, like you! there is an English saying: God gave us our relatives. Thank god, we can chose our friends! But thanks to some of the oldest of your relatives, we got in touch, being children of Ober-Gleen. Ich freu mich auch darüber.